Hastelloy C-276, UNS N10276 or W.Nr. 2.4819, is the most universally corrosion-resistant nickel alloy. It is widely used in various applications involving sulfuric acid of an extensive range of concentrations and temperatures. The two isocorrosion diagrams shown below illustrate relative corrosion resistance of Hastelloy C-276 material to sulfuric acid or sulfuric acid with 200 ppm chloride ions, respectively. The two diagrams are based on corrosion tests conducted on Hastelloy C-276 specimens(ASTM B575 Gr. N10276 plates) which are solution heat treated and in unwelded condition. Diagram A: Isocorrosion diagram for Hastelloy C-276 in sulfuric acids. Diagram A is the isocorrosion diagram for Hastelloy C-276 in sulfuric acids. It has 5 lines which are marked as “5 mpy”, “20 mpy”, “50 mpy”, “200 mpy”, and “boiling point curve” respectively. Take line-“5 mpy” for example, it represents those combinations of sulfuric acid concentration and temperature at which a corrosion rate of 5 mpy(0.13 mm/year) is expected. Below the line, rates between 0~5 mpy(0~0.13 mm/year) are expected. Between line-“5 mpy” and line-“20 mpy”, corrosion rates of 5~20 mpy(0.13~0.51 mm) are expected. 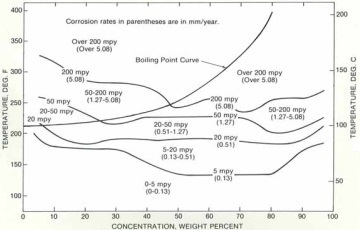 Above/below the “boiling point curve” line, the lines reflect the corrosion rates in gaseous or aqueous H2SO4 respectively. Diagram B: isocorrosion diagram for Hastelloy C-276 in sulfuric acid with 200 ppm chloride ions. Compared to Diagram A, Diagram B provides the comparison of isocorrosion lines for Hastelloy C-276 in sulfuric acid with 200 ppm chloride ions and isocorrosion lines for Hastelloy C-276 in sulfuric acid. Both tests shall be conducted in aqueous solution of H2SO4. 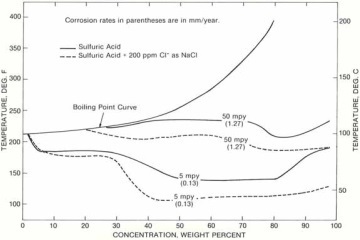 This diagram illustrates that chloride ions contained in the sulfuric acid, even in very small amount, may significantly accelerate the corrosion rate of Hastelloy C-276.